Night is falling in Brazil’s Xingu Indigenous Territory. In the centre of a thatch-roof hut stands Raoni Metuktire, cacique (chief) of the Kayapó people. All day long, on the 50th anniversary of the founding of the territory, other indigenous leaders have been speaking on everything from the need for better education to the dangers of the Belo Monte mega-dam being built in the Amazon. The third largest dam in the world, Belo Monte will flood 500 square km and dry up 100 km of river. The particular section of the river most affected is home to communities of the Kayapó, Juruna and Arara tribes, among others, and a total of 20,000 people will be displaced. Belo Monte, one of dozens of giant dam projects planned for the Amazon region, typifies the Brazilian government’s preference for development over conservation. Raoni begins a war dance and a low chant that builds to a crescendo. 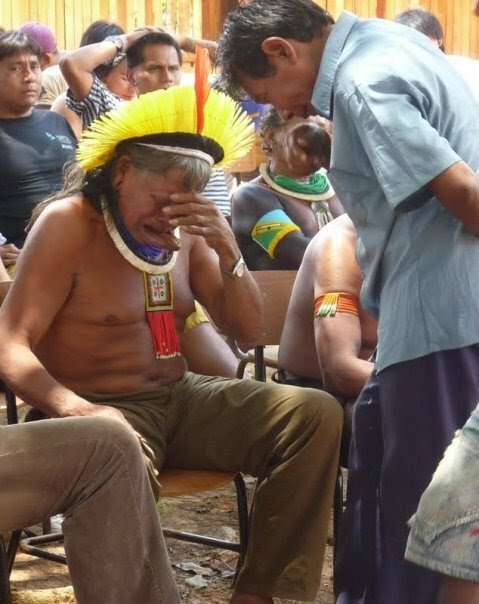 He speaks forcefully, in the Kayapó language. The wooden disk in Raoni’s lip punctuates his exhortation. The gathered tribes, from the Arara to the Xavante, painted in ink made from the genipapo fruit, loudly cheer their assent. The photo points to an essential truth – Brazil’s tropical forest is being destroyed at an accelerating rate, and Raoni is a legendary and outspoken defender of indigenous rights. But the picture is not what it seems. According to the Daily Kos, the actual explanation for Raoni’s display of emotion is that he has just been reunited with a member of his family. The danger of facile Facebook memes like this one is that they distort reality. In this case, the picture could be considered to rob Raoni of his agency. It harkens back to the “crying Indian” ads of the 1970s in the U.S. (The actor in which, incidentally, was an Italian-American in makeup and a wig, and which may have contributed to more pollution than it prevented.) Such images depict natives as passive victims, taking it lying – in Raoni’s case, sitting – down, while the bad white guys take their land and pollute their water. The story is, of course, based on five centuries of truth. And in countries with any surviving indigenous populations, it goes on today. According to the NGO Survival International, a proposed Brazilian constitutional amendment would give Congress the power to participate in the demarcation of indigenous lands. A bill currently under discussion would open up indigenous land for army bases, mining, dams and other industrial projects, and another would open up indigenous reserves to large-scale mining for the first time. Yet here, in upside-down America, the easy narrative – “White man takes powerless Indian’s land” – is being stood on its head. Far from being passive victims as they’re so often portrayed, Brazil’s indigenous peoples held widespread demonstrations last week in protest of such attempts to chip away at their constitutional rights. Reuters reported that Pataxó and Tupinambá Indians blocked roads in the state of Bahia. One thousand indigenous people were camped out in front of the Congress in the capital of Brasilia. This week, new pictures are being taken: Ones that show leaders like Raoni and Mayalú not crying or sitting down, but speaking out, and standing up. Photo Credits: Karen Hoffmann (featured and top centre images) / Picture taken on the occasion of the 50th anniversary of the founding of the Xingu Indigenous Territory in Ipavu, a Kamaiurá village in Mato Grosso. Karen Hoffmann is a freelance journalist and law student currently based in Philadelphia, USA, focusing on human rights and environmental justice in Latin America and the Caribbean. She has lived and worked in Colombia, Mexico, and Brazil, covering indigenous struggles, threatened human rights defenders, and police militarisation, among other issues. In addition to The Platform, her writing has appeared in such outlets as The Guardian, Earth Island Journal, The Ecologist, and Mongabay.com. Follow her on Twitter: @karhoff.